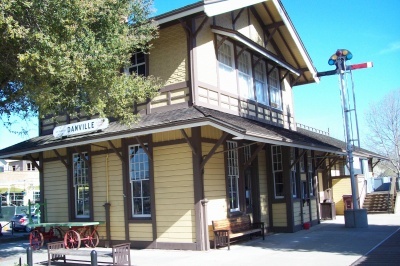 Danville CA is a town of roughly 43,000 residents, encompasses 18 square miles, and is located in Contra Costa County near Highways 680. It is centrally located in the heart of the San Ramon Valley, between San Ramon and Dublin tothe south, and Alamo and Walnut Creek to the north. 270 Properties Found. Page 1 of 7. Danville is known for its small town atmosphere and sense of community. It is truly family oriented, with activities of every type designed to bring everyone together. Summer brings "Movies Under The Stars" with family favorites being shown outdoors under the stars, and picnics being held during the show. Additionally, summer brings a free summer concert series entitled "Music Under The Stars" that is held every Saturday. There are yearly holiday and street fair events as well. Food is central to Danville's residents. The downtown boasts a wide variety of restaurants from the simple, to the elegant, and draws a wide variety of visitors from nearby communities in the area. A Saturday Farmer's Market is another highlight with its fresh fruits, vegetables and other offerings. It has highly rated schools, and cultural highlights include The Village Theater and The Museum of San Ramon Village. For those who like outdoor hiking, biking and walking, the nearby Las Tampas Regional Wilderness Region offers all of these things and more.